CM Morgana: Extra Life 2017 Rewards & Schedule – Prepare for October 13th! Thread: CM Morgana: Extra Life 2017 Rewards & Schedule – Prepare for October 13th! Trion Gamers,Save the date! Our 7th annual Extra Life event begins on October 13th at 11:30am PT, where we'll be streaming for a full 24 hours at our regular home on Twitch: https://www.twitch.tv/trionworlds!Help us help sick kids by joining Team Trion TODAY. By joining up, any money you raise goes towards your chosen Children’s Miracle Network hospital. Friends and family can sponsor your day of marathon gaming for an amazing cause.As an added bonus for your hard work and good deeds, go to our Extra Life page to see the list of rewards you can earn for fundraising, also featured below! The ScheduleWant to know when to tune in for what? 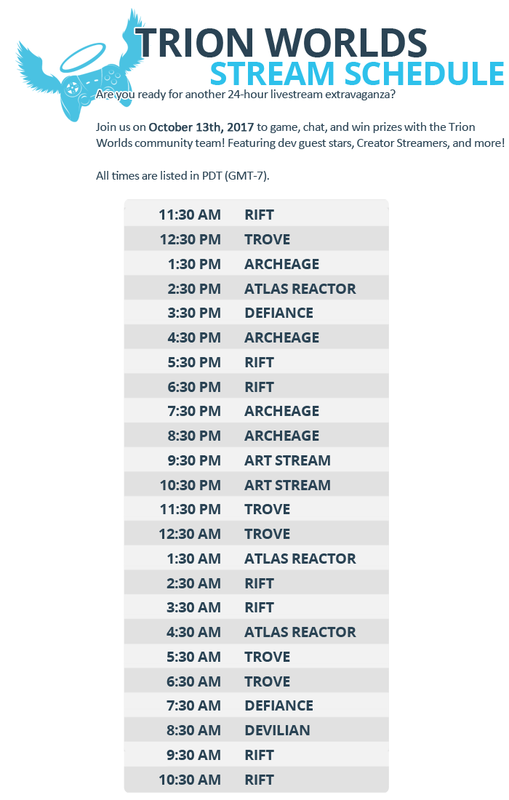 Check out our schedule below for the full 24-hour rundown!